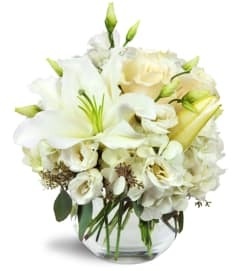 Remember your special loved one with this classic rose and carnation wreath, elegantly accented with the very best white Asiatic lilies and white stock. Red roses are a traditional way to honor our dearly departed, and this modern classic adds an esteemed touch to the celebration of a life well lived. Timeless and elegant, this wreath is perfect for any funeral service or wake. 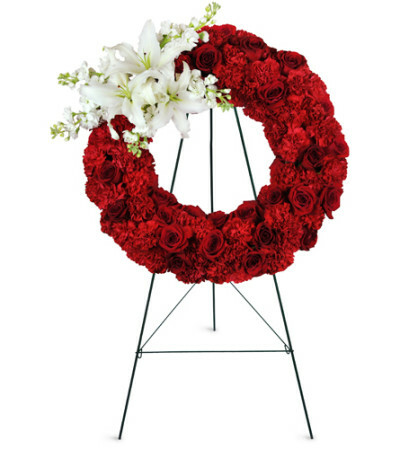 Big, beautiful red rose blooms, red carnations, and bold Asiatic lilies with white stock are arranged in a classic funeral wreath. We got an amazing help from the store. The recipient was very pleased and loved her flowers! I love shopping with a small business! I would always prefer to give my money to a small business vs a large corporate store. This experience with Flowers by Roger, The Central Flowers Inc, was A+++! Thank you for arranging such a beautiful sympthay arrangement for my colleague and her family. It was a hard time but your flowers gave them a bit of sunshine on a rainy day! 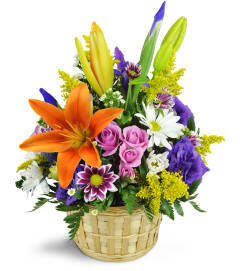 The Central Flowers Inc is a Lovingly Florist in Saugus. Buying local matters. Discover how Lovingly supports local florists. Copyrighted images herein are used with permission by The Central Flowers Inc.